"It’s been about nine days since I’ve given up sugar. It’s been hard, but it feels so good," says Know Your Value founder Mika Brzezinski. This week, we're looking at the value of our diets and how it impacts productivity. My diet has always gotten in the way of my productivity, because I have struggled with food issues for decades. In my book, “Obsessed,” I talk about food addiction and how it impacted most of my most formative years. Today, I’m finding that mindfulness therapy seems to be the solution to my continuous friction with food. If it has sugar in it, I love it. That includes candy like Butterfinger and Reese’s, icing, cookie dough, ice cream and Cocoa Krispies. I especially love chocolate and crave it after every meal. Alone in my car, I have even been known to eat the icing off six Hostess cupcakes. You get it. I have a disordered relationship with sugar. I feel gutted and empty when I haven’t had sugar for a few hours and start searching for it. On airplanes, I feel trapped if I don’t have a bag of candy or Cheez-Its to get me through the flight. As my life became more stressful with the difficult hours co-hosting “Morning Joe,” alongside several personal challenges, candy became my go-to binky. But it also has countless negative impacts on my health and my productivity. I am aware of them, which is why I feel shame and guilt after I binge. It’s a bad relationship, to say the least. I take Dialectical Behavior Therapy with Dr. Gillian Galen from McLean Hospital in Belmont, Mass. She’s on the forefront of this mindfulness-focused therapy that really teaches you to change your relationship with the very things that bring you down. 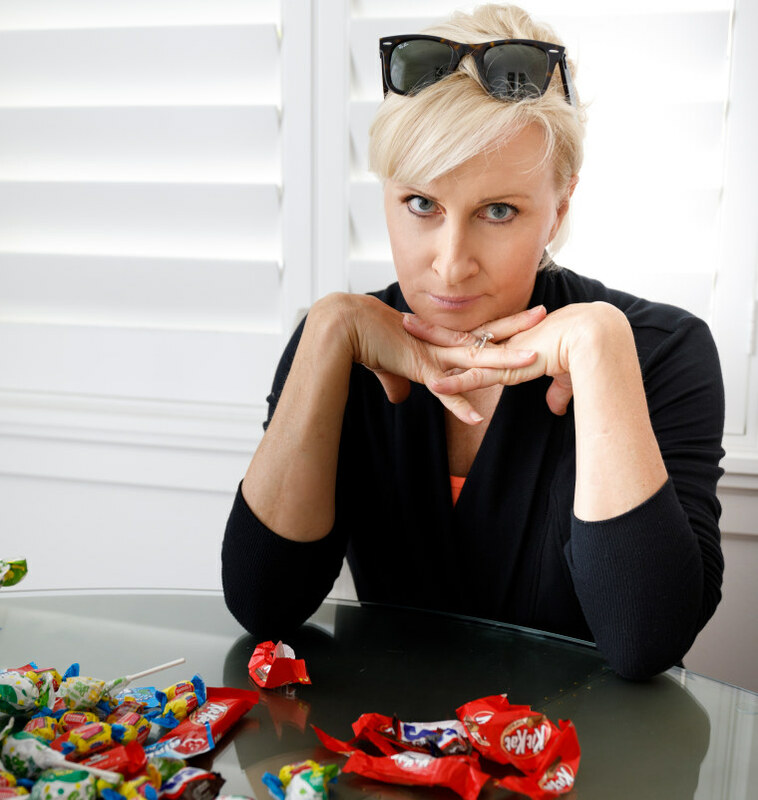 Brzezinski keeps a stash of candy, which she hasn't touched since giving up sugar nine days ago.Courtesy of Mika Brzezinski. I was skeptical at first, because I have tried lots of different therapies and approaches to deal with my relationship with food. And nothing has really stuck. But Dr. Galen has challenged me to think differently about the very things that cause complications in my life. And something really struck me in one of our sessions. After several months of practicing mindfulness, I am finding that my running is re-emerging in my life as a positive force — and it’s far less painful. In fact, running is my “hour of mindfulness.” I’m now excited to work out every day and give myself that time when my mind can rest, and my body can exercise. RELATED: What's your exercise personality? It got me wondering. Could this happen with my relationship with sugar as well? I personally didn’t think so, because I’m so addicted to candy. Nothing has ever gotten in between me and my Snickers, Double Bubble, Blow Pops, not to mention the cookie dough in the refrigerator and the icing on the chocolate cake in the kitchen. “Attachment is the root of all suffering,” Dr. Galen told me a few weeks ago. I wrote that down. I thought about my attachment to sugar and how for decades it has become a physical addiction – literally. We worked through how I needed to change my relationship with the things that I am attached to. My gorging on candy often caused me pain, guilt, shame and just plain feeling unhealthy and gross. But the more I denied myself, the more I suffered – and the bigger the binge. And I was always dreaming about the next sugar fix. I realized my attachment to candy was making me suffer. Could I free myself of that suffering? Was I mindful enough to do this? I think I am! I don’t know if I could if I didn’t spend 10 or 20 minutes every day resting my brain, being present and lowering my reactivity and my compulsions through mindfulness. But that’s exactly what is happening with this therapy, and it’s exciting! We are working on this together now. I cannot do it alone. And I need to be ready to fail. It’s been about nine days since I’ve given up sugar. It’s been hard, but it feels so good. I don’t feel alone, and I don’t feel like I am denying myself. I feel like I’m giving myself something, which completely changes my relationship with the problem! So far, there have been some real physical challenges. I craved and dreamed about sugar at first. I was tired because I didn’t have that instant fix. I felt shriveled up. On day six, I got really grumpy, and Joe and I got into a huge fight. He went out and bought me a huge caramel sundae and begged me to eat it. Half joking, half imploring, he said our marriage depended on that sundae! The delicious, gooey caramel melted in my mouth. I felt my brain wrapping around it like a big hug. It felt as if “happy serum” was coursing through my veins. How I felt backed up the science that I’m physically addicted to sugar. I got right back on the horse. I refocused on changing the relationship. That’s because mindfulness is not about just being mindful. It’s about pulling yourself back in to what you’re trying to do. Just like when you first start mindfulness and you’re trying to be aware and listen to your breathing but then, inevitably, your mind wanders. That’s what I did on the day Joe and I argued and then I ate the sundae. I pulled back in. You must pull yourself back into the relationship you want to change. No shame. No guilt. It’s all about doing things differently but knowing it’s OK when you can’t. My candy binges and sugar urges were all emotionally related, and it played out physically every day. I’m teaching my mind to better control those urges and to feel victory in a successful run without sugar. But it doesn’t mean I will never eat sugar again. Yes, I love sugar very much. But do I love it more than caring for my body? I’m working through that and trying to put sugar in a more appropriate place in my life. I plan to weave it back into my life, but in a much more moderated fashion. But right now, me and my relationship with sugar are in transition. After all, you can’t change any problem by just changing your behavior. You must look at your relationship with the problem. That’s the part that can be changed, and that’s what I’m trying to do right now.